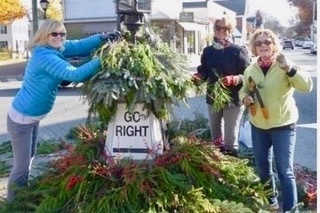 Hard at work on decorations for the Town of Essex are, from left to right, Diane Sexton, Pat Mather and Renate Houchin. 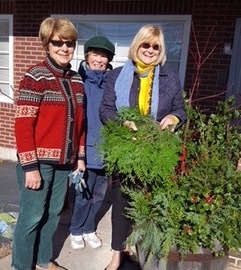 ESSEX — In preparation for the holidays, members of the Essex Garden Club decorated merchant window boxes, and tubs of the villages of Essex using a variety of evergreen cuttings from members and other generous donors from the community. Decorating the “Silent Policeman” are, from left to right, Gay Thorn, DeeDee Charnok and Sandy Meister. The “Silent Policeman” has been decorated with layers of evergreens, berries and lights. The gazebo also has been decorated with garlands and lights. The Essex Garden Club has helped the town put on a festive face for Trees in the Rigging on Nov. 26, and the Holiday Stroll on Dec. 1.